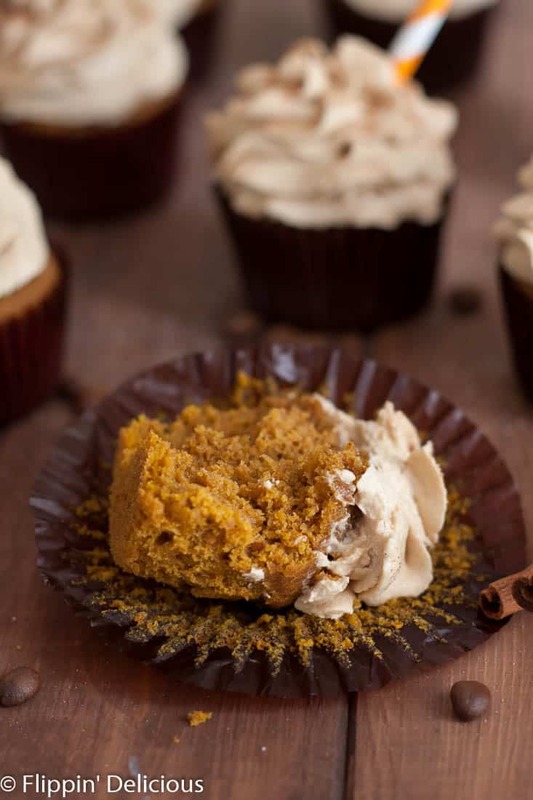 With these Gluten Free Pumpkin Spice Latte Cupcakes with Coffee Frosting you get to bite into your favorite fall espresso drink! Easily made dairy free too. Can you believe that I never had a famed PSL until last fall? From my very first sip I was a convert. I went through a Starbuck’s drive-thru as soon as it became available and hastily took my first sip. And burned my tongue. But the way that the sweet and spicy pumpkin dances with the bitter espresso truly is a match made in heaven. I haven’t made it a secret that I’ve become a coffee fan over the last year. I’ve been sharing recipes for dairy free sugar cookie creamer & chocolate peppermint creamer, skinny toasted coconut frappuccino, and chewy gluten free mocha chocolate chip cookies. AND I have an espresso frosted brownie coming up soon! For me, the addition of coffee as an ingredient in my kitchen has been a wonderful part of my culinary journey. I also love drinking it. One morning while drinking a dairy free pumpkin chai tea and writing a grocery list in preparation to make a gluten free pumpkin cake with cream cheese frosting (recipe coming soon) and a little lightbulb lit up in my brain. 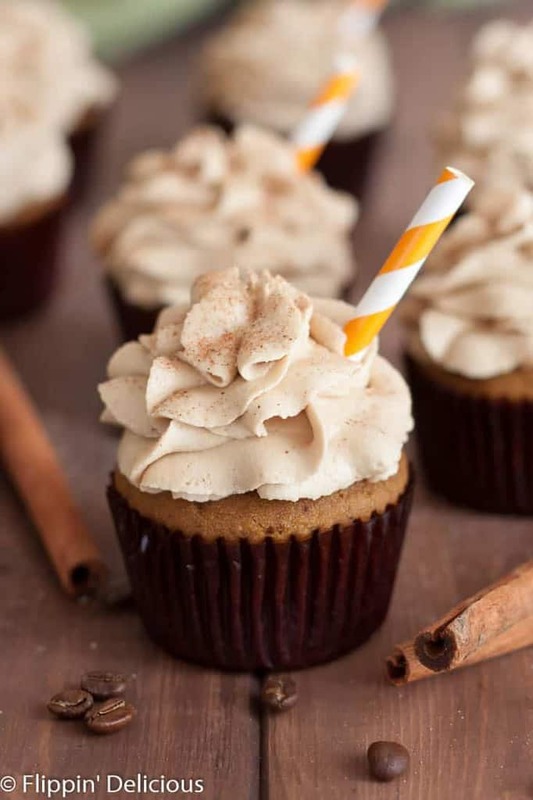 I just HAD to combine the gluten free pumpkin cake and my caffeinated beverage of choice into tender gluten free pumpkin spice latte cupcakes swirled with a light and creamy coffee frosting. When baking day came around, I did just that. I subbed the milk in my gluten free pumpkin cupcakes with some cooled espresso (any strong coffee will do) and baked the fragrant batter in my favorite every-day cupcake liners. After they cooled I whipped up a fluffy coffee frosting using non-hydrogenated palm shortening, Earth Balance, and instant coffee dissolved in vanilla. Why the instant coffee? Well I have tried making espresso frosting before (in those brownies) but I had some difficulty getting the consistency right because adding enough espresso to get the coffee taste I craved tended to make the frosting a little too runny (I remedied that with some extra powdered sugar and some cocoa powder). Instant coffee helped me to deliver the coffee flavor in a concentrated dose. I also didn’t want to run into problems with a separated frosting. Liquid and palm shortening don’t like to mix! If you’d prefer, you can use the frosting from my espresso brownies (recipe coming soon!). 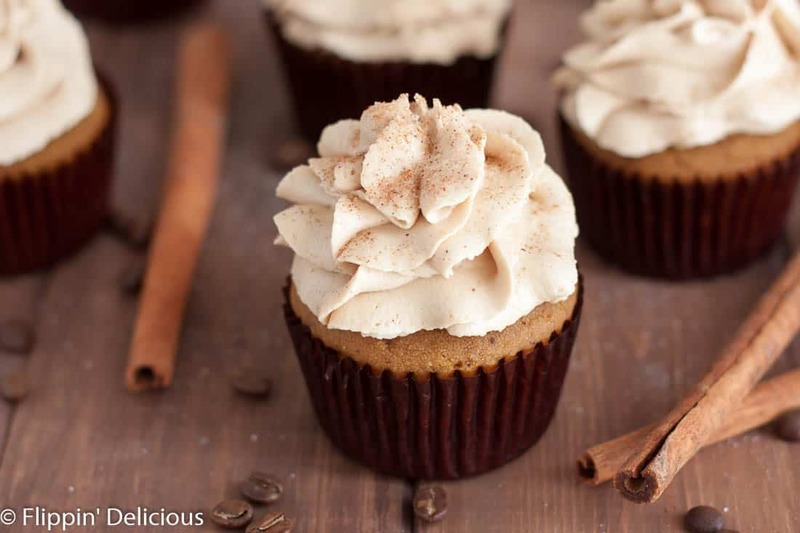 Then you will have a hint of cocoa in your cupcakes too! 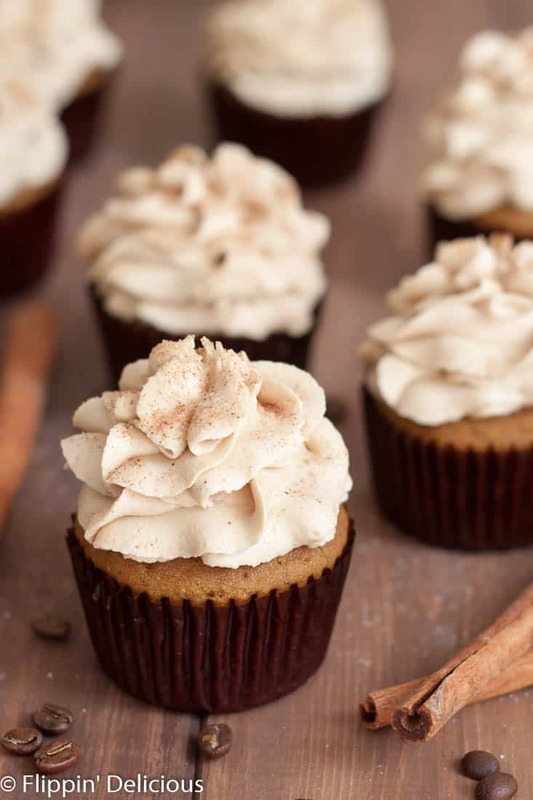 I finished each cupcake off with just a sprinkle of cinnamon sugar to make them sparkle! Preheat oven to 350F. Line your cupcake pan with cupcake liners, or lightly grease. Combine all of the dry ingredients in a bowl. Form a "well" in the mixture and add all of the wet ingredients into that "well" and mix until combined. Bake for 15-18 minutes or until a toothpick comes out clean, with just a few little crumbs. In a small bowl dissolve the instant coffee in the vanilla extract. In a bowl with electric beaters, whip the vegan butter and palm shortening until very light and fluffy, about 4-5 minutes. Add 2¼ cups powdered sugar, vanilla extract/coffee and pumpkin spice extract, if using. Whip the frosting for another 2 minutes or until light and fluffy. It was very warm in my kitchen the day that I made the frosting, so I needed 3 cups to make the frosting the right consistency. If it isn't 90 degrees in your kitchen with butter so soft it is almost melted (real life right here!) then you probably won't need as much, which is why the recipe says to add 2½ cups powdered sugar first, and then add extra as needed. I want to make these, like yesterday, because they look sooooo good!! 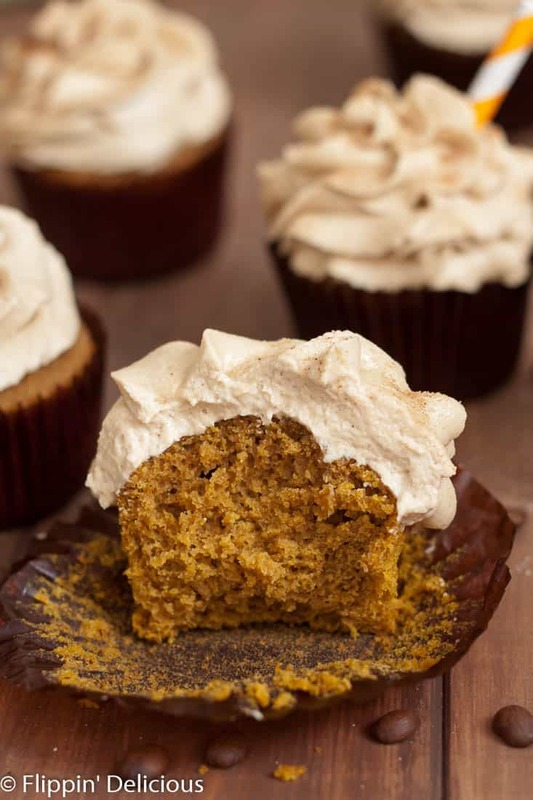 I will make these but with sweet potato puree as I am allergic to pumpkin.. Cant wait to try it! Thanks!! Sweet potato puree should work just fine. I hope that you love them!